"Running Mac OS X Tiger" is the ideal resource for power users and system administrators like you who want to tweak Tiger, the new release of Mac OS X, to run faster, better, or just differently. If you are ready to dig deep into your Mac, this book expertly guides you to the core of Mac OS X. It helps you understand the inner workings of the operating system, so you can know how to get the most out of it. And, it gives you countless ideas - and step-by-step instruction - for customizing and revving up Tiger to your specific needs and your liking. 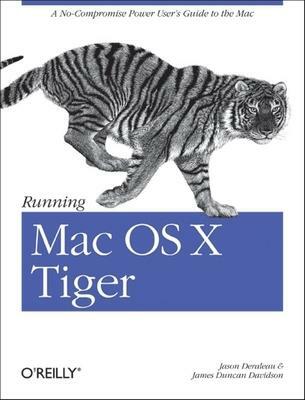 Completely revised and updated for Mac OS X Tiger, "Running Mac OS X Tiger" covers all the new features and functionality of Tiger. You can count on authors Jason Deraleau and James Duncan Davidson to give what you need - and not bother with what you don't. They don't spend time on Finder tips and keyboard shortcuts; they focus on showing you what makes a Mac tick and, more importantly, how you can make it tick just the way you want it to. Easy to follow and intuitively organized, "Running Mac OS X Tiger" is divided into three parts: "Getting Started" introduces Mac OS X and explains how it's put together and why it works; "Administration Essentials" gives you the tools you need to examine how your system is running and adjust all the knobs behind its operation; and "Networking and Network Services" covers the ways Mac OS X interfaces with the world around it, including wireless and spontaneous networking. Developer Tools for Mac OS X, including Xcode, are discussed throughout the book as appropriate. For the growing number of intermediate to advanced users who are ready and eager to customize Mac OS X, "Running Mac OS X Tiger" delivers everything you need to become master of your Mac. Jason Deraleau has been a computer enthusiast since the Commodore 64. Having spent time focusing on DOS, Windows, Linux, and FreeBSD, his newest passion it the Macintosh and Mac OS X. Currently residing in Western Massachusetts, he works as a systems administrator by day, IT consultant and technical writer by night. Jason is the co-author of the upcoming Running Mac OS X Tiger, was a presenter at O'Reilly Mac OS X Conference 2004, and is a contributing author on the O'Reilly Network. James Duncan Davidson is a freelance author, software developer, and consultant focusing on Mac OS X, Java, XML, and open source technologies. He is the author of Learning Cocoa with Objective-C (published by O'Reilly Media, Inc.) and is a frequent contributor to the O'Reilly Network online website as well as publisher of his own website, x180 (http://www.x180.net), where he keeps his popular weblog. Duncan was the creator of Apache Tomcat and Apache Ant and was instrumental in their donation to the Apache Software Foundation by Sun Microsystems . While working at Sun, he authored two versions of the Java Servlet API specification as well as the Java API for XML Processing. Duncan regularly presents at conferences all over the world on topics ranging from open source and collaborative development to programming Java more effectively. He didn't graduate with a Computer Science degree, but sees that as a benefit in helping explain how software works. His educational background is in Architecture (the bricks and mortar kind), the essence of which he applies to every software problem that finds him.